✤ Why? 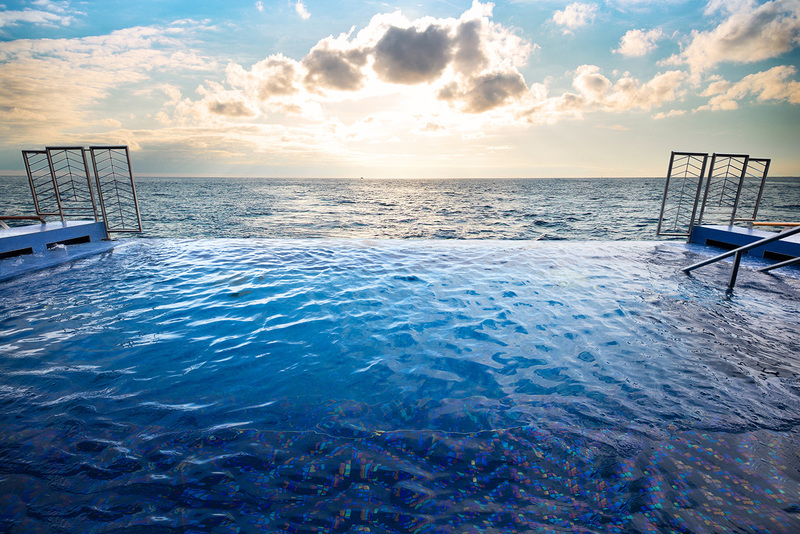 Watch dolphins leap through the waves and enjoy breathtaking ocean views above – and below – water as you wallow in the glass-backed infinity pool that’s cleverly cantilevered off the stern of Viking Cruises’ 930-passenger Viking Sea. ✤ Après pool? The snow grotto – with real snow – in the LivNordic spa is fast becoming a cruising legend. ✤ Where to? Itineraries include the 14-night “Viking Homelands” Baltic cruise, from £4,190 (vikingcruises.co.uk). ✤ Why? 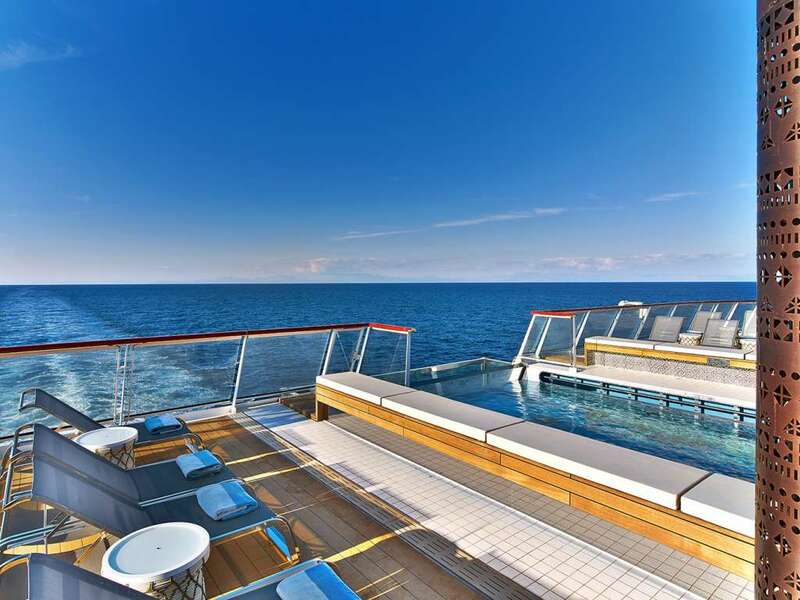 If your kids grumble that “pools are boring”, they’ll change their tune on Norwegian Cruise Line’s newest ship. The 4,266-passenger Norwegian Escape boasts the largest water park at sea, with no fewer than four thrilling waterslides. ✤ Après pool? Try the ship’s three-storey ropes course with its high-flying zipline – if you dare. ✤ Where to? Itineraries include a 7-night New York to Bermuda round trip, from £679 (ncl.com). ✤ Why? 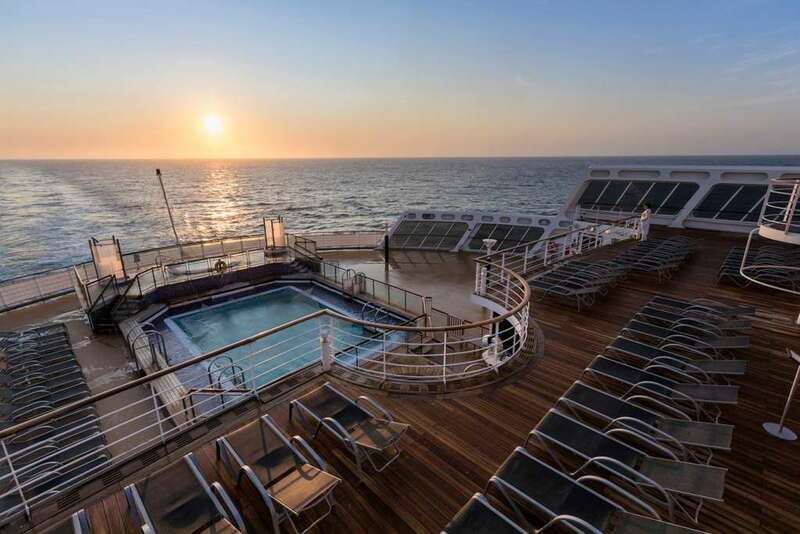 The venue for Cunard’s legendary sail away parties, the terrace pool on Deck 8 of flagship Queen Mary 2 is one of the classiest hangouts at sea – especially when you’re admiring the Manhattan skyline with a glass of champagne in hand. ✤ Après pool? The world’s only ocean liner, QM2 also offers the only ocean-going planetarium. ✤ Where to? Itineraries include a 27-night Caribbean round trip from Southampton, from £2,141 (cunard.co.uk). ✤ Why? Can’t choose between the pool and the bar? Surrounded by palm trees, the dramatically lit plunge pool on Uniworld’s 159-guest river cruiser Catherine is actually inside the ship’s Bar du Leopard – so passengers can order a cocktail while chilling in the balmy waters. ✤ Après pool? This being a river cruise, regular stops mean there are countless shore excursions to enjoy. ✤ Where to? Itineraries include the 7-night “Burgundy and Provence” cruise departing from Lyon, with prices from £2,699 (uniworld.com). ✤ Why? 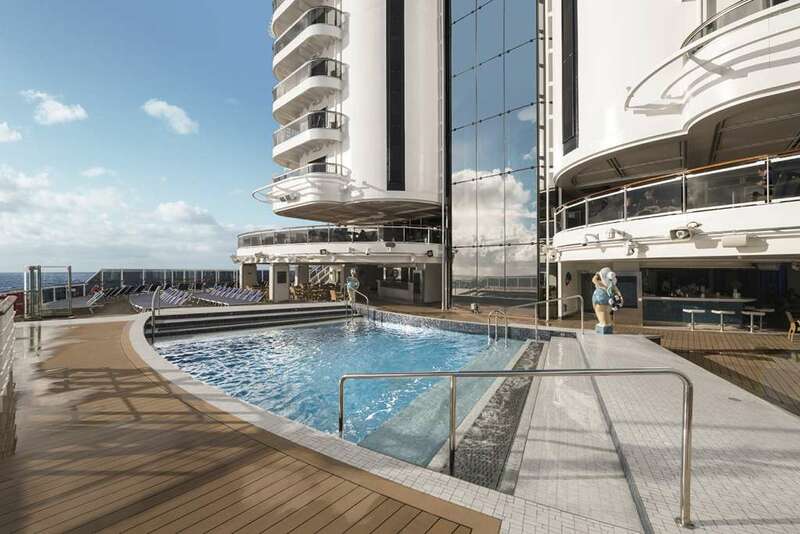 With its marble-lined interiors and hand-made chandeliers, Regent Seven Seas’ ultra-luxury Seven Seas Explorer is sure to put you and your loved one in a romantic mood – and that’s before you discover the delightfully private infinity pool. ✤ Après pool? Feast your eyes on the ship’s amazing art collection – including a genuine Picasso or two. ✤ Where to? Itineraries include a 14-night Cape Town-to-Rio cruise, from £4,989 (rssc.com). ✤ Why? Fancy surfing without leaving the ship? 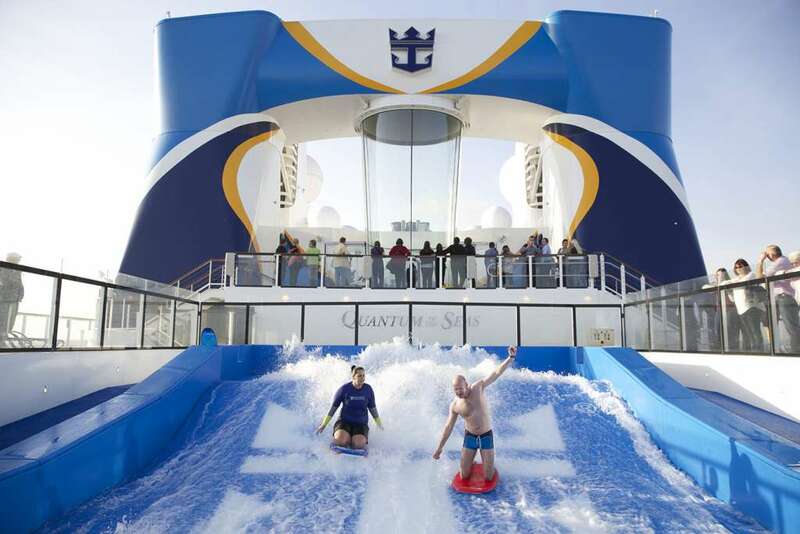 Step aboard Royal Caribbean’s Quantum of the Seas, where a wave machine in the FlowRider pool mimics ideal surfing conditions so passengers can boogie-board the breakers, then admire their performance on a flat-screen TV from the comfort of the bar next door. ✤ Après pool? Quantum is just packed full of activities, including a circus school complete with trapeze, and the North Star glass gondola, which allows passengers to sail 300ft above the sea. ✤ Where to? Itineraries include a 5-night Nagasaki and Fukuoka cruise, departing from Baoshan (China), from £518 (royalcaribbean.co.uk). ✤ Why? If you fancy playing Pharaoh on a Nile cruise (and frankly, who wouldn’t?) Sanctuary Retreats’ 36-passenger Sun Boat III is for you. Cleopatra’s Oasis might not be filled with asses’ milk, but this bijou pool is still an enchanting spot to lie back and watch the world go by. ✤ Après pool? Other perks on this 1920s-themed vessel – which is regularly voted among the “100 most beautiful boats in the world” – include 18 delightfully designed cabins and an elegant lounge where afternoon tea is served. ✤ Where to? Itineraries include an 11-day “Treasures of Egypt” cruise departing from Cairo, combining a 5-day Nile cruise aboard Sun Boat III with a 6-day land tour. Prices from £4,595 (scenic.co.uk). ✤ Why? 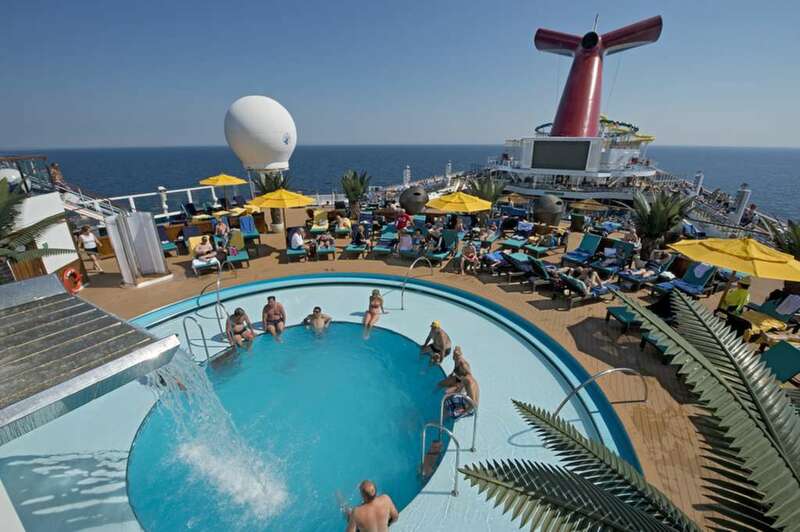 If your idea of heaven is to kick back in a hammock, listening to the blissful sound of a cascading fountain as you sip exotic cocktails, Carnival Cruise Line’s 3,006-passenger Carnival Sunshine is for you. Fed by a waterfall and surrounded by palm trees, the ship’s adults-only plunge pool is as close as you can get to beach life on a cruise. ✤ Après pool? Apart from WaterWorks water park (prepare to be drenched when you least expect it), the ship has sports courts, a video arcade and an elegant spa. ✤ Where to? Itineraries include an 8-day Southern Caribbean cruise, round-trip from Port Canaveral, Florida, from £474 (carnival.com). ✤ Why? The glass-roofed solarium pool surrounded by animal sculptures must be the best kept secret aboard Royal Caribbean’s 2,501-passenger Brilliance of the Seas. 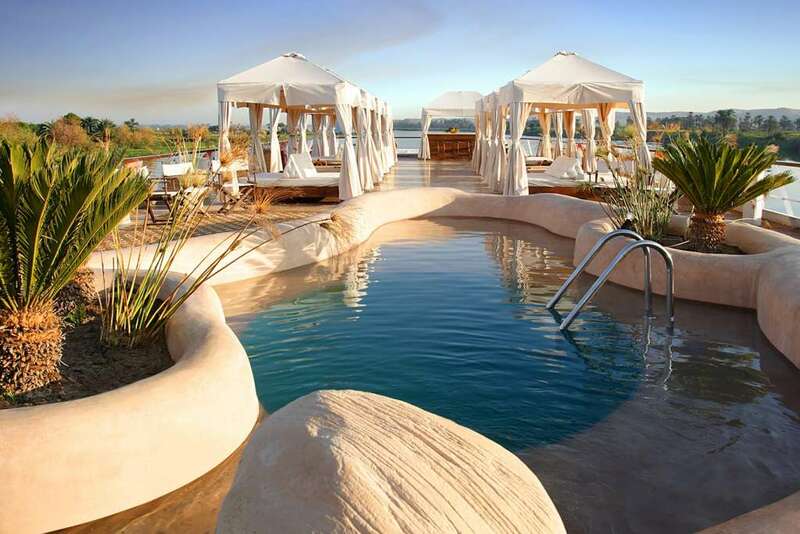 The pool even has waterfalls, hot fountains and a bar. ✤ Après pool? Jaw-dropping views from the nine-storey glass atrium are worth lingering over. ✤ Where to? Itineraries include a 14-night Baltic cruise from Amsterdam, from £1,516 (royalcaribbean.co.uk). ✤ Why? 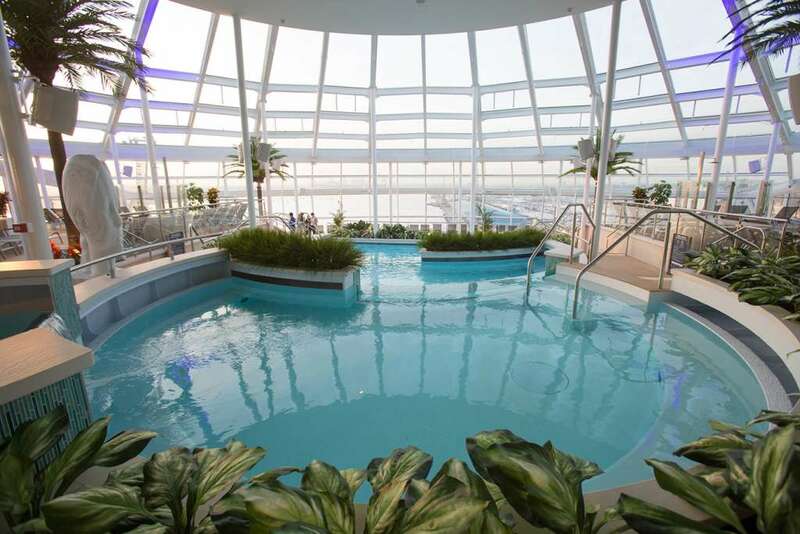 Served by soaring glass elevators, the South Beach pool at the stern of MSC Cruises’ 4,134-passenger Seaside offers breathtaking views. 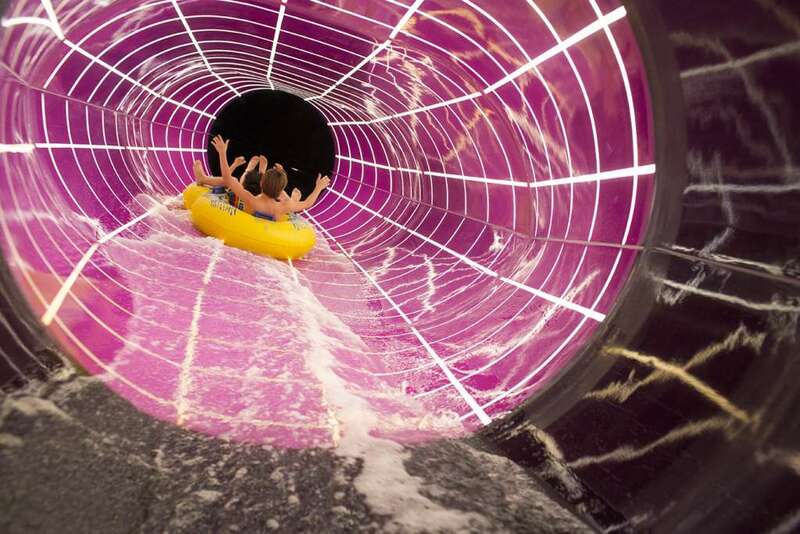 And if you like a little adrenaline with your water, the multi-storey aqua park has two high-speed racing slides extending over the side of the ship. ✤ Après pool? 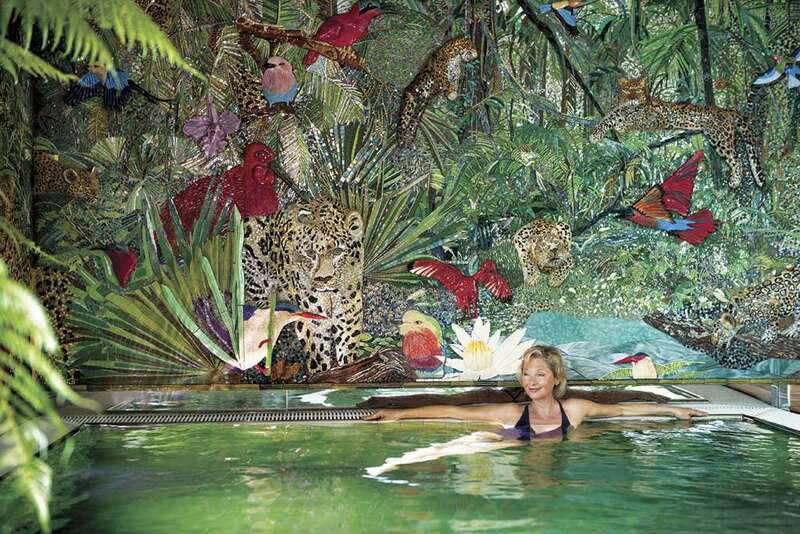 With an adventure trail, outdoor spa and super-long ziplines, the options are almost endless. ✤ Where to? Itineraries include a 14-night Caribbean cruise from Miami, from £949 (msccruises.co.uk). A British travel writer/photographer based in the Mediterranean. Heidi hosts an award-winning radio show for British Airways.